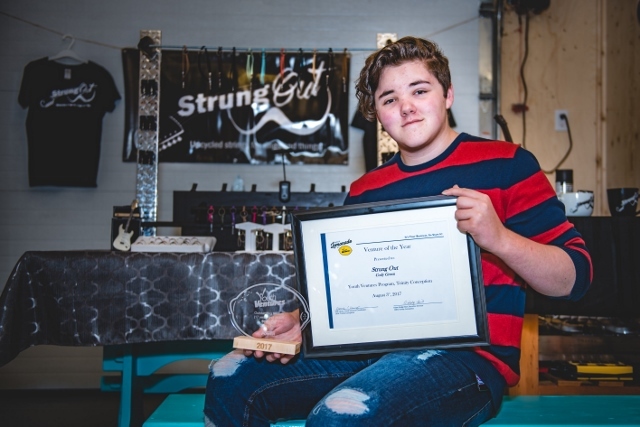 At just 15 years old, Cody Green of Carbonear, started his business in the summer of 2017 because of the major influence that music has on his life. Strung Out “Upcycled Strings for Rings and Things” is a business that up-cycles guitar strings and makes them into rings, earrings, bracelets, chokers etc., instead of putting them in the landfill where they have negative effects on the environment. Cody’s products are displayed and sold at O’Brien’s Music Store in downtown St. John’s and at Ocean View Art Gallery in Carbonear. Cody has recently reached out to a unique client base where he up-cycles guitar strings for those with family members or friends that have passed away and turns them into a special memory that they can wear each day to remember their loved one. This is a very rewarding part of his business. For the summer of 2017, Cody won “Venture of The Year” at the local Youth Ventures awards and went on to win “Outstanding Venture” at the 2017 provincial awards ceremony. CBDC Trinity Conception congratulates Cody on his success to date and we look forward to more good things in the future.